FAYETTEVILLE, Ark. – The University of Arkansas dedicated the Silas Hunt Memorial Sculpture during a ceremony Wednesday, Aug. 29. The sculpture, located between Old Main and the Pi Beta Phi Centennial Gate entrance, is the first work of art commissioned by the university’s Public Art Oversight Committee. The sculptor, Bryan Massey, is a professor of art at the University of Central Arkansas, Conway. The sculpture celebrates the legacy of Silas Hunt, a decorated World War II veteran from Texarkana, who enrolled in the University of Arkansas School of Law in February 1948. He completed one semester of classes before becoming ill and withdrawing from school. He died the next year from tuberculosis, aggravated by injuries he received during the war. Hunt’s admission to the university began the process of integration at the University of Arkansas and in colleges and universities across the southern United States. Silas Hunt’s legacy can be found around campus in many ways. In 1993, Silas Hunt Hall was named. This building, located on Maple St., is home to the university’s office of admissions, the Registrar's office, the student accounts office and the office of financial aid. The Silas Hunt Scholarship Program, started in the fall of 2004, is a four-year academic scholarship that includes a comprehensive academic support program involving monthly meetings, peer mentoring and social resources for the scholarship recipients.The university’s Silas Hunt Legacy Award, introduced in April 2006, recognizes individuals for their significant achievements or contributions to the community, the state and the nation. Also in 2006, Silas Hunt: A Documentary premiered, a biographical film commissioned by Donnie Dutton, the former dean of what is now the Global Campus. In March 2011, the university dedicated the Silas Hunt Memorial Room in the Arkansas Union. This was the realization of a plan to promote diversity within the building. Massey is a professor of art at the University of Central Arkansas, Conway. He is primarily a stone carver working with a variety of stone including alabaster, soapstone, limestone, marble and granite. He also casts iron, bronze and aluminum as well as working in the fabrication of steel sculptures. He was recently selected as one of 84 artists nationally for inclusion in a new book called Studios and Work Spaces of Black American Artists. His most recent work, The Jazz Player, was selected and presented to former President Bill Clinton for the celebration and commemoration of the fifth-year anniversary of the Clinton Library in Little Rock in November 2009. It is now located in the Little Rock Sculpture Garden. A native North Carolinian, he’s been living in Arkansas since 1988 with his wife of 26 years, Delphine. They have two daughters and one son. His work is exhibited internationally, nationally and regionally. 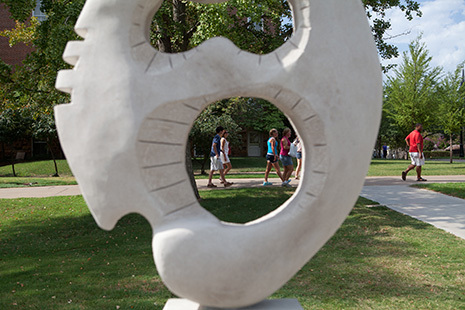 The University of Arkansas Public Art Oversight Committee was formed in 2009 as part of a major drive to increase the amount of art on display in outdoor areas throughout campus. In fall 2010, the committee began seeking established professional artists to send qualifications and proposals for an outdoor monument. Massey’s proposal was selected the following spring.